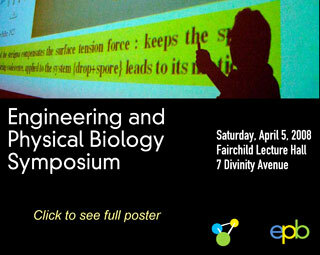 On Saturday, April 5, the Engineering and Physical Biology (EPB) Symposium will be held at the Fairchild Lecture Hall, 7 Divinity Ave. Speakers from several fields – Physics, Engineering, Chemistry and Molecular Biology – will present significant recent findings in the area. This Symposium is sponsored by the PhD Track of the same name and marks a milestone for the EPB project. EPB is only in its second year as a PhD community for students wishing to “probe living systems through the lens of physics and engineering”. The Symposium comprises the first half of an “EPB day” designed to bring students from the EPB program together with outstanding visiting scholars as well as faculty from its constituent parts (MCB, Physics and SEAS). The day will be divided into two parts. The morning (until 1:00pm) will be a public symposium featuring four visiting faculty. Everyone in the Harvard community is welcome to attend, and the talks should be of wide general interest. In a short period of time, EPB has grown from a gathering of faculty into an increasingly coherent community addressing questions at the physics/engineering/life sciences interface. The EPB Symposium will provide a chance for the public, as well as the students, to see some exciting work in this area. For more information on the Symposium, contact Kimberly Kriz. More information on EPB can be found at http://www.physicalbiology.fas.harvard.edu .